The MRV "Revolution" is the new flashlight in Lumapower's LumaHunter series, a very bright light designed for outdoor activities. The MRV uses a Cree LED and has several options for the batteries being able to use two primary C123 lithiums, two rechargeable 123 lithiums or one 18650 rechargeable battery. The light comes with a choice of two switches, a tactical switch with momentary activation and twist action for constant-on or a reverse clickie switch. There is a GITD button that you can use with any switch too. The MRV has two brightness levels selected twisting the joint between the battery tube and the heatsink (the nickeled part) there is a very low click when you switch from high to low or low to high. The operation of the low/high mechanism wasn't very good in our opinion because with so many joints it is hard to twist where you need, sometimes you untwist the tailcap or the reflector instead of the body-heatsink union, furthermore and the difference between high and low wasn't very noticeable. Maybe after lubing the threads the operation will be smoother but we would have liked a much lower low mode. It is our guess that a future two stage tailcap can solve this as Lumapower has done in the M3 model. The beam of the MRV offers a very tight and bright hotspot with a surrounding corona offering plenty of sidespill light. The throw of the MRV is incredible, it can out-throw almost any other LED light and it can also win against some big incandescent flashlights as the surefire M3(!). From our tests buildings, trees and objects more than 200 meters away can be illuminated, it is almost hard to believe how bright the light is. The construction is really excellent, the body is made of Ha-III aluminium and will not get dented or scratched unless something terrible happens, the reflector is very big and very smooth, there are double o-rings in the joints to make the light water proof, contacts are clean and every part shows quality details. The tailcap has two wings that can be used to let the light tailstand and to thread a lanyard or a splitring. The bezel is crenelated so it can be used to know if the light is on and may also be used for self defense if needed. There is a glow in the dark oring in the bezel that glows after the light is turned off, this helps finding the MRV in the dark. It has a very solid feel in the hand, from what you see in the picture expect it to be smaller than what you think and heavier than what you think. Runtime in high mode is about 30 minutes on rechargeables 123, about 1 hour with primaries and more than 3 hours with a 18650 battery. So far the 18650 is the option we like for the long runtime and brightness. Regulation is better with rechargeable 123s where the light output is constant until it just turns off completely. 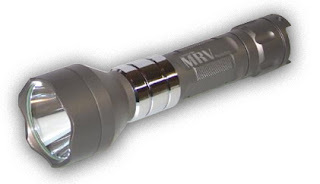 The MRV is an awesome light for outdoor activities with an incredible throw and excellent construction quality. If you are outside often you should really take a look at this flashlight. You can read more and order for $120 from BatteryJunction. The LiteFlux LF2 is a programmable AAA light with many different modes and gizmos. 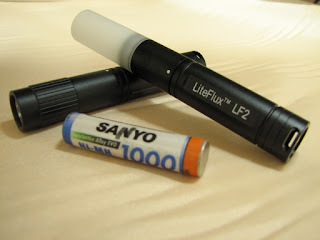 The light can use any AAA sized battery from 0.9V to 5.0V this means it will work on alkalines, lithiums, nimh rechargeables and it will also work with li-ion 10440 3.7v batteries for extra brightness. The LED is a Cree XR-E; hands down the brightest LED in the market at the moment of this review. The body is HA-III aluminium with orings to make it water resistant and the lens is made of glass with AR coating. The switch is a twisty working different than most other twisty switches since you unscrew to turn on and screw back to turn it off, this probably helps water resistance when the light is off, we may call this a "reverse twisty". From Off there are two positions when unscrewing the head called P1 and P2. From the factory P1 and P2 will give you two brightness levels to choose. But this light has many more modes and each mode is programmable so how do you do that with a twisty switch with 2 positions?. The answer is very simple when you go from P1 to P2 and back to P1 or from P2 to P1 and back to P2 with less than 1 second between modes a "switch" is defined, emulating a "click" in a light with a clickie. The number of "switches" you do is used to program the light and access different modes. We will call a switch movement SW to explain the different modes. SWx1 is standard mode with P1 and P2 brightness levels. If you do SWx2 you go into variable brightness mode, you use P2 to change brightness and P1 to fix it, you can do SWx2 to reverse the direction from low to hi or from hi to low. This is a great mode to use the level of brightness you need for any specific situation. SWx3 is the strobe mode, there are two strobes P1 and P2. SWx4 is SOS mode with two brightness levels in P1 and P2. SWx5 is a battery test mode, SWx7 is a demo mode, SWx8 is used to turn on/off battery overdischarge protection, SWx10 resets factory defaults. Then we have SWx6 to enter the programming mode, we won't go into detail on the "how" but this is a list of what you can program: you can define the brightness of P1 and P2 in standard mode, you can define the brightness and frequency of the strobes in P1 and P2, you can define the brightness of the SOS mode for P1 and P2. So you can, for example, define P1 as 100% brightness and P2 as 1% brightness. Define one strobe to be very fast and bright for self defense and the other to be very slow and dim as a locator beacon, etc. Many different options and the interface while strange is not bad when you get used to it. When the light is turned off it remembers the last mode so it will be back when you use it again. Included as an accessory is a very nice diffusor head that makes the light great for reading, ambient illumination or as a beacon. This is a great light if you like many modes and versatility we absolutely loved it. You can read more and order for $55 from LiteFlux website.